We Pakistani.pk always try to provide you the informative post through which you know the amazing and shocking knowledge about the world. Here in this post, I brought the list of 10 beautiful and huge mansions in the world. These all mansions are famous in the world due to their big size and expensive price. The house is the place where people live with their family. The big size and luxury houses are called Mansions. There are numbers of huge mansions in the world but in this post, you will be able to know the 10 beautiful and huge mansions in the world below. Let’s check out the post below. Hala Ranch is the 95-acre huge estate located in the north of Aspen, Colorado. It was built in 1991 and named by Prince Bandar bin Sultan. This mansion has its own mechanical shop, car wash shop, and waste-water treatment plant. The mansion contains 15 bedrooms, 16 bathrooms, and an interior elevator. It also contains the reflecting pool, courtyard, and swimming pool fishing pond, racquetball court, and tennis court. The price of Hala Ranch is estimated about $135 million. Maison de L’Amitie is a 60.000 square foot mansion located in Palm Beach, Florida. This luxury mansion was bought by billionaire Donald Trump. The price of this mansion is $95 million. It is famous for the huge capacity in the garage for 80 cars. It also contains the long swimming pool, 18 bedrooms, 3 guest cottage and 22 bathrooms. All the windows are bulletproof with diamond and gold fixtures. Medina Mansion is the luxury house owned by Bill Gates. This exclusive mansion is located in Washington. It is a 1.5-acre mansion contains 7 bedrooms, 6 kitchens, 24 bathrooms and 6 fireplaces. It also contains swimming pool, theater, library, reception hall and exercise room. The most important are that the house never leaves you alone. The music follows you from room to room with hidden speakers. The famous Ira Rennert’s house is also on the list of top 10 huge houses in the world. The house was built in 1991 and located in Hampton, USA. The house spans 62,000 square feet and includes 21 bedrooms and 18 bathrooms. It also includes 12 chimneys, long dining room, 10,000 square foot playhouse for basketball and two-lane bowling alley. The house has huge space in the garage for 100 cars and a theater also. Villa Leopolda is one of the world’s famous large villas located on the French Riviera. The villas situated on 18 acres ground. It has several owners but it is now owned by Lily Safra. The villa contains 19 bedrooms with furnished bathrooms, walk-out terrace, fireplaces, sporting courts, bowling alley, multiple kitchens, Movie Theater and dining rooms. Windsor castle is famous for the Queen’s Dollhouse. It is the luxurious and beautiful castle located in Berkshire. The cast is well designed with artwork also. It contains parks and landscapes which make it popular in the world. Istana Nurul Iman is the largest residential place in the world. It is located on the banks of Brunei River. It is the house of Sultan of Brunei named Hassanal Bolkiah. The house contains 1,788 bedrooms, floor area of 2,152,782 square feet, 257 bathrooms, 5 swimming pools, a garage for 110 cars, guest houses, and mosque. The Manor is also known as the Candy’s Spelling Mansion. This mansion is located in Holmby Hills of Los Angeles. It was built in 1988 and known as the largest house in California. This house also displayed in various television series and films. It is a two-story mansion includes the screening room, three rooms of wrapping presents, gym, bowling alley and garages. Connecticut Mansion is located in Farmington. It is a 21 bedroom house famous for its artistic designs and well-furnished rooms. It contains 25 bathrooms, private casino racquetball courts, gym, and swimming pools and most important is the night disco. This house is among the list of top 10 huge mansions in the world. This is the world’s largest and tallest luxury mansion located in Mumbai and owned by Mukesh Ambani. This is a 27 story towering mansion contains hanging gardens, swimming pools, two-story health center parking area for 168 cars, a floor for home theater and many more things which make this house world’s largest and biggest home. This list of 10 beautiful and huge mansions in the world has been generated after long time search. 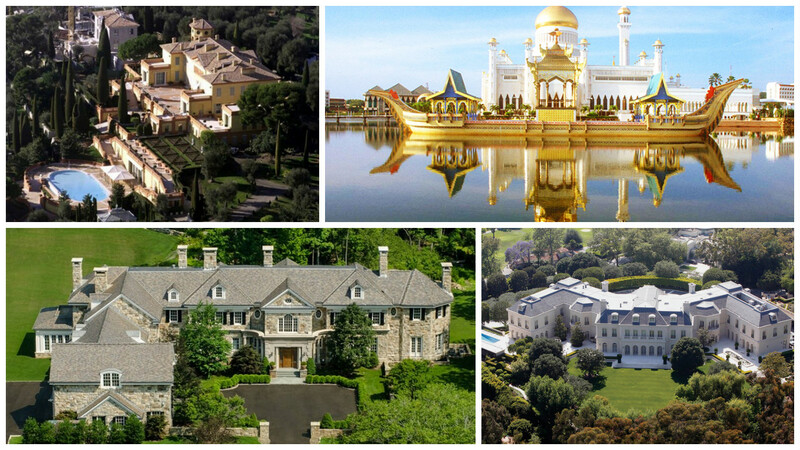 These all mansions are the world’s top listed and largest houses. No doubt, they’re expensive, luxury and full of artwork.